The La Plata County Sheriff's Office said Thursday it has identified remains of the body of Dylan Redwine, the 13-year-old boy who went missing in November north of Vallecito Reservoir. The sheriff's office received confirmation Thursday from the Colorado Bureau of Investigation, which performed forensic testing. The bones were found during a five-day search that was conducted Saturday through Wednesday. Law-enforcement officials combed a 12-mile stretch of Middle Mountain Road looking for clues about Dylan's disappearance. Middle Mountain is north of Vallecito Reservoir. The search area ranges from 8,000 to 11,000 feet in elevation and consists of deep canyons and dense forest. Searchers found “articles” they thought might be linked to the case Sunday. At first they were uncertain if they found human or animal remains, Bender said. They spent four more days combing the area to be sure they retrieved all possible pieces of evidence. Family members met with investigators Thursday and were told of the development in the case, Bender said. Efforts to reach the boy's mother, Elaine Redwine, and father, Mark Redwine, for comment were unsuccessful. “It's sad to finally learn that he's no longer with us,” he said Thursday during an interview in Bayfield. Dylan was reported missing Nov. 19, 2012, by his mother, who lives in the Colorado Springs area. He was staying with his father, who lives about three miles north of Vallecito Reservoir, as part of a court-ordered visitation during the Thanksgiving holiday. The case has drawn national attention, including a Feb. 26-27 appearance on the “Dr. Phil” television show. During the show, Elaine Redwine and Mark Redwine engaged in a heated confrontation, with each accusing the other of responsibility for their son's disappearance. The two-part episode ended with Mark Redwine refusing to take a polygraph test. Authorities declined Thursday to say whether there appears to be foul play. “We're pursuing it as a criminal investigation and have since almost day one,” Bender said. A Durango Herald photographer saw someone drive by Mark Redwine's home Thursday, turn around and yell “murderer” before driving away. Authorities have not named Mark Redwine as a suspect. “We have not labeled anyone as a suspect,” Bender said. A reward for information leading to the finding of Dylan had reached $50,500. It is unlikely the reward will be given to anyone because no one provided information that led investigators to his location, Bender said. “This was Sheriff's Office initiated, not on a tip or new information,” he said. Human remains and other items were found during the course of the five-day search in different locations, Bender said. He declined to specify what other items were found or over how large an area the remains were scattered. “Because it's an ongoing investigation, we're not releasing a description of what we found, as far as specific items,” he said. The remains were found in a drainage about 8 to 10 miles from the father's house, through the rural road system, Bender said. It is closer by a straight line. Bender declined to be specific about exactly where the remains were found. 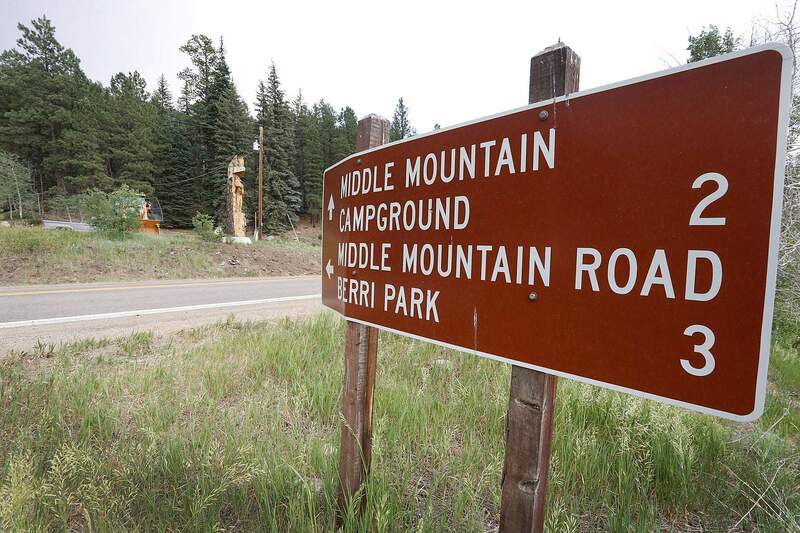 “It was roughly halfway up Middle Mountain Road,” he said. Middle Mountain is a Forest Service road that begins from the northeast side of Vallecito Reservoir. Since Dylan's disappearance, investigators have had two missions – to find the boy and to determine who might be involved in his disappearance, Bender said. Since November, investigators have searched Vallecito Reservoir and its 12-mile shoreline at least 15 times with search dogs, divers, boats equipped with sonar, helicopters and fixed-wing aircraft. They have amassed hundreds of tips from across the country and around the world, including from psychics and someone in Australia who reported seeing Dylan in a restaurant. Redwine arrived Nov. 18 in Durango as part of a court-ordered visit to spend the Thanksgiving holiday with his father. A surveillance camera captured his image at 5:46 p.m. at the Durango-La Plata County Airport. Another surveillance camera captured his image at 7:05 p.m. at Walmart in Durango. 7:22 p.m. – He and his father went to McDonald's in Durango. 9:37 p.m. – Dylan sent his last text message to a friend, saying he planned to meet up with him early the next morning. He was not heard from since. Mark Redwine said he saw Dylan early Nov. 19 at his house north of the reservoir. The father said he ran errands in Durango, and when he returned four hours later, the boy was gone. shane@durangoherald.com. Herald Staff Writer Jordyn Dahl contributed to this report. The search for Dylan Redwine The search for Dylan Redwine ended as everyone hoped it wouldn't, with the identification of his remains. The search for Dylan Redwine ended as everyone hoped it wouldn't, with the identification of his remains. Elaine Redwine fights back tears with her son Cory Redwine, 21, as she talks about her son Dylan Redwine in November 2012. Mark Redwine, center left, discusses the area he and the volunteers in his group will be covering on County Road 240 near Edgemont Ranch in December 2012. In November 2012, members of the New Mexico State Police Dive team conduct sonar scanning of the bottom of Vallecito Reservoir during the search for 13-year-old Dylan Redwine, who went missing from his father’s home north of the reservoir Nov. 19. In November 2012, Elaine Redwine shares a tender moment with her significant other Mike Hall on the dam at Vallecito Reservoir during the eighth day of the search for her son, 13-year-old Dylan Redwine. A dive team from New Mexico State Patrol spent the day scanning the bottom of the reservoir with sonar. Investigators search a travel trailer next to Mark Redwine’s house in Vallecito in November 2012. In November 2012, a pick up truck owneed by Mark Redwine is towed to an undisclosed location Thursday afternoon as investigators exercised a search warrant on property in the continued search for Dylan Redwine. Ryan Nava, 13, hands a flyer of Dylan Redwine, 13, to a County Road 502 resident, with friends Fernando Stubbs, 14, center, and Lesley Herring, 15, behind him on Saturday as they went door to door handing out flyers of the missing boy. In November 2012, investigators gather next to a Colorado Bureau of Investigation truck parked in front of Mark Redwine's house in Vallecito during the extensive search of his property Thursday in the continued investigation for missing13 year old Dylan Redwine. In November 2012, Elaine Redwine fights back tears as she talks about her son Dylan Redwine. In November 2012, Roy Vreeland has his search dog Cayenne sniff a fishing pole that was found on the dam at Vallecito Reservoir to see if any scent belonging to Dylan Redwine is on it late Sunday afternoon. Nothing was found and search will continue on Monday morning. In November 2012, Ryan Nava, 13, tapes a up a flyer of Dylan Redwine, 13, a missing boy, behind a mailbox with friends Fernando Stubbs, 14, center, and Lesley Herring, 15, on Saturday as they went door to door handing out flyers to residents on County Road 502. In December 2012, Mark Redwine, center left, discusses the area he and the volunteers in his group will be covering on Saturday morning on County Road 240 near Edgemont Ranch. In December 2012, Connie Allen of Vallecito was out on County Road 240 near Edgemont Ranch with other volunteers searching for any sign of Dylan Redwine. "I just hope there will be something found that will help locate him or give the family some help." Helping out with the effort at right is Darren White of Bayfield. In December 2012, hundreds turned out for the search of Dylan Redwine on County Road 240 near Edgemont Ranch. Butch Knowlton, the director of the La Plata County Office of Emergency Management, gave instructions to the volunteers. In December 2012, Denise Hess, a family friend of the Redwines’ folds her hands on top of a donation jar for the search for Dylan Redwine from within her Plaza Video shop in Bayfield. The 13-year-old has been missing since Nov. 19. In December 2012, Mark Redwine spoke about Dylan Redwine from his front door. "All we want for Christmas is Dylan home." In December 2012, 6-year-old Megan Stumpf attaches a missing sticker to her shirt as she waits in line for dinner at Pine Valley Church in Bayfield during a benefit dinner and silent auction to support the efforts to find Dylan Redwine. Megan’s brother Colton Stumpf was in the same grade as Dylan when he attended school in Bayfield. In December 2012, organizer Denise Hess of Bayfield said she hoped to turn out a thousand ribbons in support of the search for Dylan Redwine. Jessica George, 12, left, daughter of James and Tricia George, and Carolyn Cook, 13, daughter of Jarrett and Anne Cook, help with the effort at Hess’ store, Plaza Video. The two said they are friends of Dylan. In December 2012, Amy Sienkowski, counselor at Lewis-Palmer Middle School in Monument, pauses as she reflects on 13-year-old Dylan Redwine before his disappearance Nov. 19 from his father’s home in Vallecito. Sienkowski helped organize a “Blue Ribbon” campaign to raise money to help Dylan’s family. The ribbons are being sold for $1 each, however, Sienkowski reported some students donated $20 for a single ribbon. In December 2012, Kaitlynn Boldt, 20, Dylan Redwines cousin, wipes tears from her eyes as she recounts the last time she saw Dylan. In front of Boldt are photographs she made of Dylan during the summer. 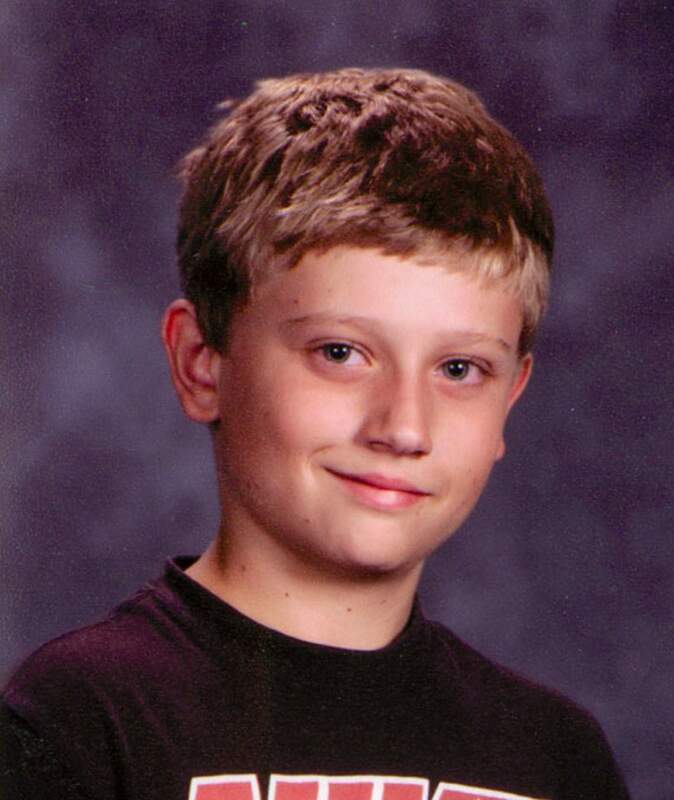 Dylan Redwine, 13, has been missing since Nov. 19 from his father’s home in Vallecito. In December 2012, Dylan Redwine’s brother Cory Redwine, 21, talks about his brother who has been missing since Nov. 19. In January 2013, Elaine Redwine, mother of Dylan Redwine, gives an interview while flanked by relatives and friends during a rally for Dylan across the street from the home of Dylan’s father, Mark Redwine. Connie Allen of Vallecito was out on County Road 240 near Edgemont Ranch with other volunteers searching for any sign of Dylan Redwine in December 2012. “I just hope there will be something found that will help locate him or give the family some help, said Allen.” Helping with the effort at right is Darren White of Bayfield. Cory Redwine, 21-year-old brother of Dylan Redwine, speaks at a vigil for his brother at Eagle Park in Bayfield in November 2012. About a hundred people attend a vigil for Dylan Redwine at Eagle Park in Bayfield in November 2012. Mark Redwine, father of Dylan Redwine, speaks at a vigil for his son at Eagle Park in Bayfield in November 2012. In this undated photograph, Dylan Redwine, 13, in his baseball uniform. Mark and Elaine Redwine appear on an episode of the Dr. Phil show. In November 2012, Jade Pascale, left, daughter of Casey and Corinne Pascale, and Kylee McCory, daughter of Andy and Pam McCory, both seventh-graders at Bayfield Middle School and classmates of Dylan Redwine, take part in a vigil that drew about a hundred people to Eagle Park in Bayfield. In November 2012, about a hundred people attended a vigil for Dylan Redwine at Eagle Park in Bayfield. A grieving Jim Schank, owner of the Schank House and Buffalo Gap, takes down Dylan Redwine's name from the sign in front of the Vallecito Reservoir store on Thursday. 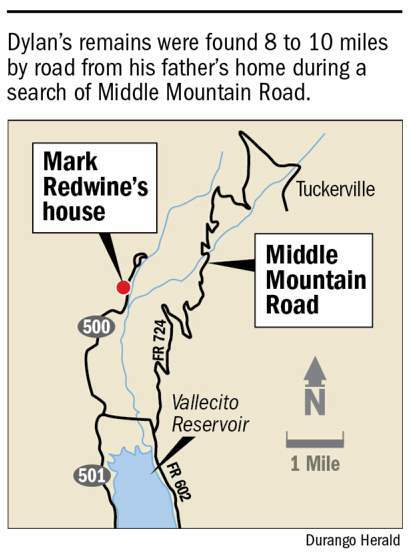 Dylan Redwine’s remains were located several miles up Middle Mountain Road near Vallecito Reservoir. 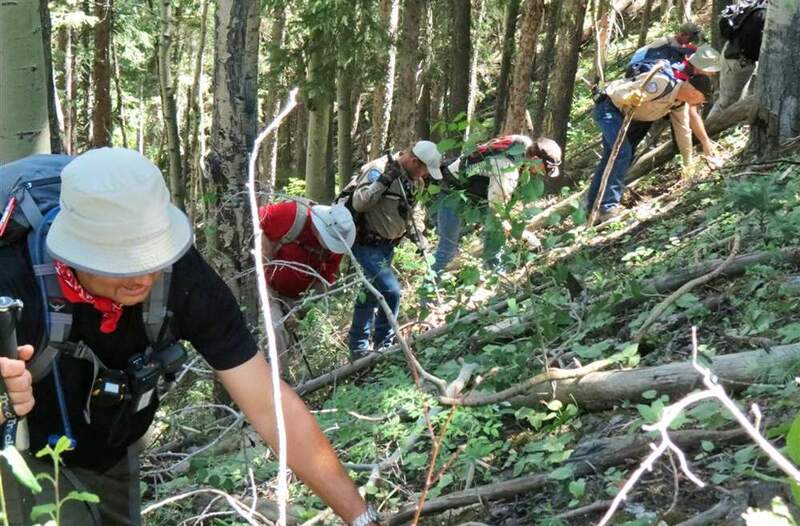 Searchers comb a hillside along Middle Mountain Road during a search earlier this week for clues in the Dylan Redwine case.